(CNN) -- A late double wicket burst by Peter Siddle left Australia shading the honors after the first day of the opening Ashes Test against England in Cardiff. 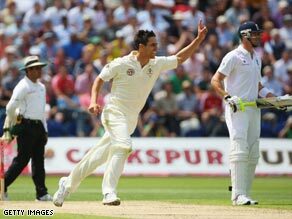 Johnson celebrates the key wicket of Bopara just before lunch in Cardiff. Siddle removed England all-rounder Andrew Flintoff for 37 and then bowled wicketkeeper Matt Prior with a perfect inswinger as the home side closed on 336 for seven wickets. Flintoff and Prior had taken them past 300 with a fluent 86-run stand for the sixth wicket until Siddle, playing in his first Test, saw Flintoff draw a wide delivery on to his stumps. A beginner's guide to the Ashes »Prior was quickly dismissed for 56, leaving Jimmy Anderson (2 not out) and Stuart Broad (4 not out) to survive until the close. Earlier, Kevin Pietersen top-scored with 69 and shared a 138-run stand for the fourth wicket with Paul Collingwood (64) as England recovered after losing three wickets before lunch. Again, both went in quick succession with Ben Hilfenhaus taking his second wicket to remove Collingwood and Pietersen making a hash of a reverse sweep to be caught by Simon Katich off Nathan Hauritz. Pietersen was upbeat despite England failing to press home their advantage. "336 for seven we will definitely take, being greedy you would probably say for five," he told Sky Sports. Watch Warne's interview with CNN ». England captain Andrew Strauss won the toss and elected to bat on a slow pitch at Sophia Gardens. He shared in a opening stand of 21 with Alastair Cook which was ended by a sensational catch in the gully by Michael Hussey. Cook had 10 when he made good contact with a wide delivery from Hilfenhaus only to see Hussey dive full length to pluck it out of the air. That brought Ravi Bopara to the wicket and with Strauss they set about repairing the damage with some success. They put on 46 without being seriously troubled until Mitchell Johnson induced a mis-hook from the England captain who was caught by Michael Clarke for 30. Essex star Bopara had shown confident form with a cover drive for a boundary off Johnson the highlight, but the lynchpin of the Aussie attack soon had his revenge. Just before lunch, a slower ball totally deceived Bopara who lobbed a gentle catch to Phillip Hughes to be caught for 35. England opted to play two spinners, Graeme Swann and Monty Panesar in their line-up with paceman Graham Onions left out of the starting line up. Australian preferred Hilfenhaus to Stuart Clark, playing off-spinner Hauritz on a wicket expected to take turn. Australia hold the Ashes, regaining them in their 2006-07 home series after England's 2005 triumph on home soil. Legendary Aussie leg-spinner Shane Warne played a key role as they won the Ashes back, retiring from Test cricket after the series. He is tipping Australia to keep their hold on cricket's most famous trophy. "The history and tradition of the game is huge. You get the chance only once in every four years to play in a place like Lord's in an Ashes series -- it's a special achievement," he told CNN. "The guys generally play pretty well over here. England deserved to win in 2005 but after they were embarrassed in Australia so they'll feel like there is work to do." England will look to take their score nearer 400 on a key second day in Cardiff with Australia hoping to wrap up their innings early on what remains a good batting wicket.